Billions of US$ have been lost to date due to various crypto related hacks, as noted in our Chart of the Week. Each successive hack has focused the industry’s attention towards obtaining proper cyber liability coverage, in addition to also much sought-after volatility and directors & officers liability insurance. Cryptocurrencies impose higher risks than traditional financial instruments for insurance issuers, one major reason being the relative frequency of crypto exchange hacks. 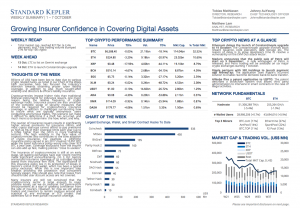 Insurance issuers are also uncertain of the complete scope of security measures that should be required for cryptocurrency insurance coverage, in addition to challenges surrounding how to insure what are typically anonymous users conducting anonymous trades. This scenario can make it difficult to determine if a theft has occurred, and much more so to determine the how, when, and why. The caution of insurance issuers results in significantly higher annual premiums for insurance clients, and most crypto start-ups cannot afford to pay premiums as high as 5% of their coverage limits each year (up to 5 times higher than the norm in more traditional sectors). The high volatility in the face value of cryptocurrencies also contributes to the slow adoption of crypto insurance. For example, a US$10mn insurance policy signed in January 2017 covered 10,957 BTC, while the same insurance policy would only cover 923 BTC a year later. Coverage exclusions from the insurer can also add up fast, making policies “close to useless”. The insurance of cryptocurrencies is still at an early stage, yet leading exchanges have over recent months made significant announcements. On 3 Oct. Gemini announced insurance coverage of its custodied digital assets from insurance firm AON. The significance of this insurance policy lies in its protection of losses in Gemini’s online (hot) wallet, which has been a typical policy exclusion. While this is one important step towards providing the protection that consumers typically expect, they should also note that losses from unauthorized user account access are not covered. Many insurers are still not convinced that the cryptocurrency sector is large enough to cover possible losses, yet we do interpret the Gemini-AON announcement as a sign of growing confidence from the side of insurers. However, for now we still advice traders and investors to remain cautious around and sceptical of any exchange or ICO project that advertises full or even partial insurance coverage.